I’m all for trying to take some of the stress out of life whenever possible. To that end, I’m a planner and a list-maker. I make lists for everything: to-do lists, grocery lists, and on and on (and on and on). In an effort to make the what-to-make-for-dinner dilemma less of a stress, I’ve been making lots of freezer meals. I double recipes when I can to put a second meal in the freezer, and I also do bigger freezer meal prep days where I’ll put two to three weeks worth of meals in the freezer at a time. I’ve found that, not only does it save me time and money, it also cuts way down on my stress. If I know that the next day is going to be really busy, I’ll just pull something out of the freezer the day before so that I don’t have to worry about dinner the next day. Not only do I do that with meals, but I also make other “extras”, too – things like muffins, cookies, and rolls. 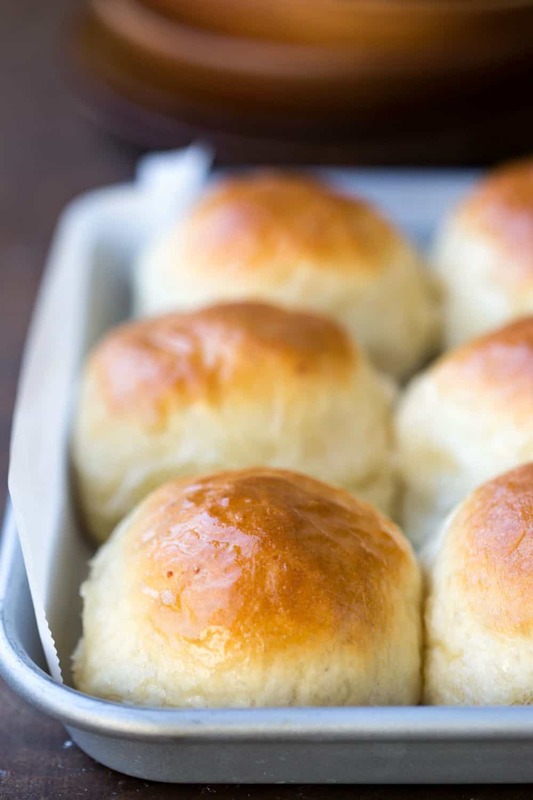 These Homemade Brown and Serve Rolls are an easy way to make sure that I can always have fresh rolls when I want them. I have some super quick and easy 60 minute roll recipes and even 30 minute roll recipes. 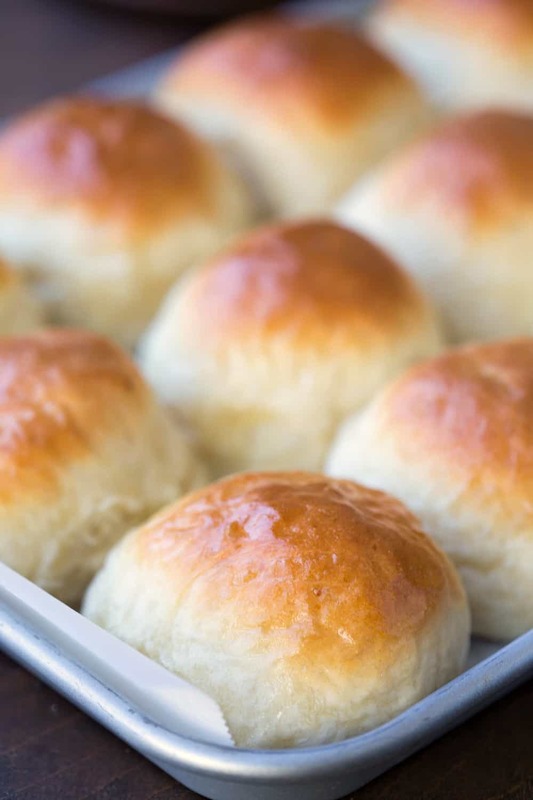 These rolls, though, can finish baking in just 7-10 minutes, which is pretty hard to beat. 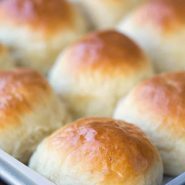 Homemade brown and serve rolls are also great for around the holidays. When you have a little extra time, you can make a batch, and then pop them in the freezer. Then, just finish baking them for fresh rolls without the stress. And less stress is always a win! 2/3 c. warm milk about 105F. In the bowl of a stand mixer fitted with the paddle attachment, combine warm water, sugar, and yeast. Let yeast sit for 5-10 minutes, or until foamy. Stir in milk, oil, mashed potatoes, and eggs. Add salt and 3 cups flour. Stir to combine. Continue adding flour, 1/4 cup at a time, until dough clings to to dough hook and clears the side of the bowl. Cover, and let sit until dough doubles in size, about 1-1 1/2 hours. Place rolls on a parchment-lined baking sheet. Cover, and let rise for 30 minutes. Toward the end of the rising time, preheat oven to 275 F.
Bake rolls for about 20 minutes, or until set but not browned. Remove from oven, and let cool to room temperature. Place in freezer bag, and freeze until ready to use. 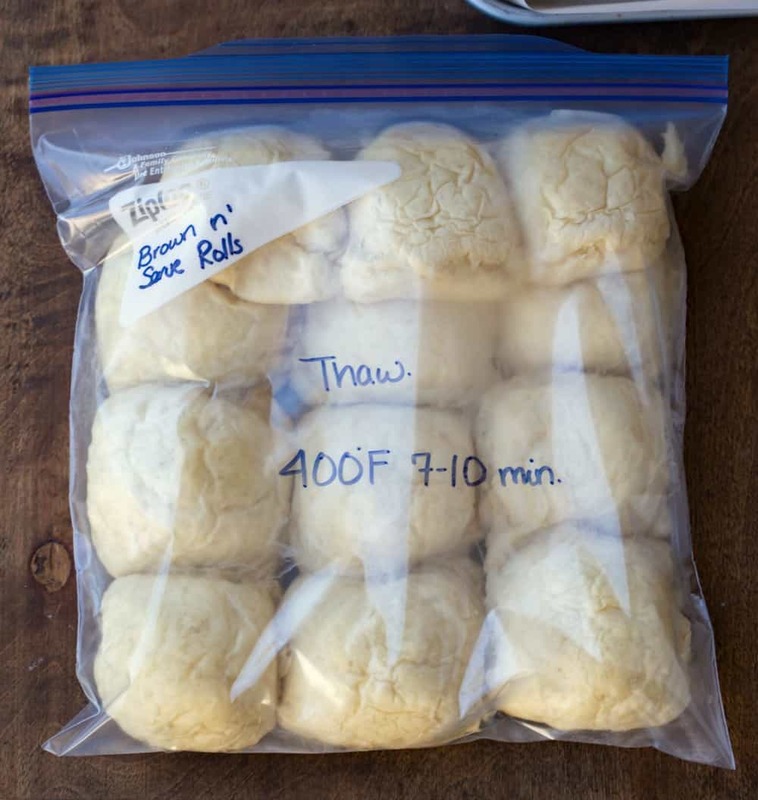 When ready to finish baking the rolls, thaw in fridge overnight. Bake rolls for 7-10 minutes, or until golden brown. At this point, I brush them with melted butter before serving, but that's completely optional. *I use the water that I cooked the potato in. Are the thawed rolls at room temp when baked or straight from the frig? I just bake them from the fridge. Hope that helps! I jusrt made these this morning and thought I’d pass on a bit of,a,tip, for what it’s worth. As I haven’t made them before I wasn’t sure how much would each be when cooked. So I weighed the door after the first rise and divided that weight by 24 and made the rules the same size and it came out to exactly 24 rolls and I think they will be perfect . Are use the metric system as what that is what we use here in Canada and each role came out to about 66 g. This is my only way of ensuring they will all be the same size at least until I get used to the recipe . These look yummy! What size baking sheet do you use for the 24 rolls? I can’t wait to try them. Thanks! I used a half sheet pans for the rolls. If you don’t have a pan that’s that large, you could use two 9×13 rimmed baking sheets instead. This look AMAZING! 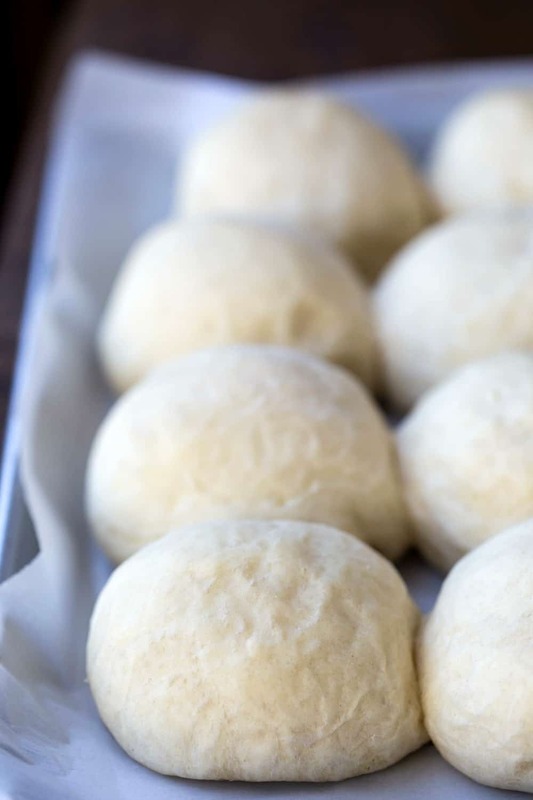 I’ve frozen roll dough after shaping them, but I’ve never tried partially baking them first. What a great idea! I’ll have to try it. Katie: love your blog. So many great recipes! I’m going to try making the dinner rolls. If I’m not going to freeze them first how long do I bake them? @15 minutes @400.? Thank you so much! I really appreciate that. =) If you don’t want to freeze them first, you can bake them at 375F for about 10-15 minutes.